This is a 2nd floor apartment with a private entry in the rear building of TRAX Gallery property adjacent to the hip and happening 4th Street. The space is filled with art and ceramics made by the proprietors and others. $125.00 per night for two people plus city taxes. There is a king size bed in the bedroom. There is a minimum of a 3 day rental. There is a queen size blow up bed which fits in the living room for additional guests; $25.00 per extra person. Breakfast items; usually fresh fruit and yogurt, are provided upon advanced request. Coffee and tea will be there for you. Longer stays may request use of the washer and dryer. Weekly stays can negotiate the price. No breakfasts. A one time cleaning fee of $60.00 will be added to the total cost of booking. 14% city fees added. Transient Occupancy Tax is 12% and 2% monthly enforcement fee goes to the city of Berkeley. The apartment is on the 2nd floor of Robert’s “private” ground floor art studio, which is used during the day but not at night. The apartment has lots of natural light and windows with shades. This is an urban location with the delights and sounds that brings (Southern Pacific RR). There may be noise from Robert’s sculpture making during the day, but no paint or offensive odors. Street parking only; Non smoking of any kind; Walking distance to transportation everywhere. The rental includes WiFi, cable TV, a bedroom with king size bed, a queen sized pull out sleeper couch in the living room, down comforters, pillows, blankets and sheets. The bathroom has a shower with towels soap, shampoo, and hair dryer. 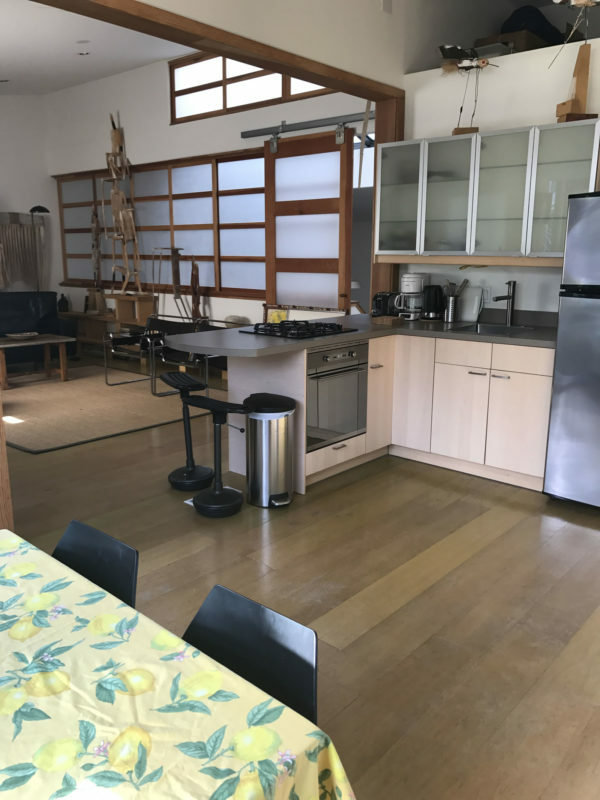 There is a well equipped kitchen with a gas range and oven, a full scale refrigerator, a micro wave, and dining table and chairs. Additional guests ($25.00 each per night). It is professionally cleaned after every guest stay ($60.00 fee). We are ½ block to shopping, restaurants, and coffee, on Berkeley’s well known 4th Street. It is a walkable distance to the San Francisco Bay, BART (bay area rapid transit), near to trains (trains whistles can be loud), bus, and Whole Foods. There are many eating options on 4th Street including a bagel shop, Bette’s to go and Bette’s sit down for breakfast and lunch, The Pasta Shop, Peets Coffee, Artis Coffee as well as dining restaurants; Mexican “Tacubuya”, “Zut”which is a seasonal CA. cusine menu. Iyasare, exquisite Japanese cuisine is one of our favorites. There is a plethora of shopping including an Apple Store, just behind us, as well as a bookstore, mens and women’s clothing, Mac, Benefit, Lulu Lemon, Anthropology, Design Within Reach and more. Plans can change: entire refund for cancellations made14 days prior to booking . 50% refunds for cancellation 7 days prior. No refunds for cancellations after 7 days. All cancellations will incur a 5% visa service fee. Spend $600 in TRAX purchases at the time of your stay and receive 1 night free stay; the more spent, the more free nights, up to 5 nights. I stayed for 5 days at this unique and special art haven conveniently located in the heart of Berkeley two blocks from 4th Street and only 20 minutes from downtown San Francisco. The owners are both renowned artists and very accommodating in every way and very respectful of your privacy; couldn’t find nicer people! One feels inspired by the wonderful art and pottery, everywhere you look, created by the owners Sandy and Robert. It feels as if you are on an art gallery vacation. Very private, quite and peaceful. Would highly recommend to anyone who wants to have a tranquil getaway from the hustle and bustle of everyday life. Your very own private entrance. I can’t wait to return there as soon as possible. know people who enjoy art and beauty in their surroundings. TRAX gallery Artbnb is really spacious and clean. We loved being able to walk to shopping and restaurants just 1/2 block away. Buses are just around the corner as well as the Southern Pacific railway to cities North and South. The trains do blow their whistles at the crossings which takes some getting used too, but well worth it considering the advantages of the location. I enjoyed Soul Cycle for exercise as well as the Zen Spa for massage and acupuncture both within a block. Excellent stay!! It doesn’t get much better than staying with quality art, having your own private, clean apartment, friendly knowledgeable hosts, and being able to walk to restaurants and all that 4th Street offers. The details define the stay: King size comfortable bed, a large living room, great kitchen, clean shower. What a treat! And, what a bargain-(for the price of a cheap motel!) If you appreciate an artful, modern ambiance, then this is your spot. Excellent location, walk to restaurants and shops, easy to highway. Comforts of home and office.